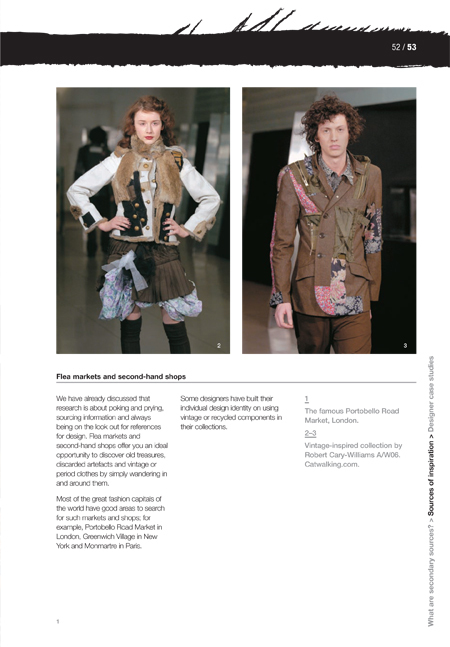 Simon Seivewright is head of fashion at Northbrook College, UK. He is also a freelance designer and has worked with leading fashion houses and designers including Vivienne Westwood and Christian Lacroix. 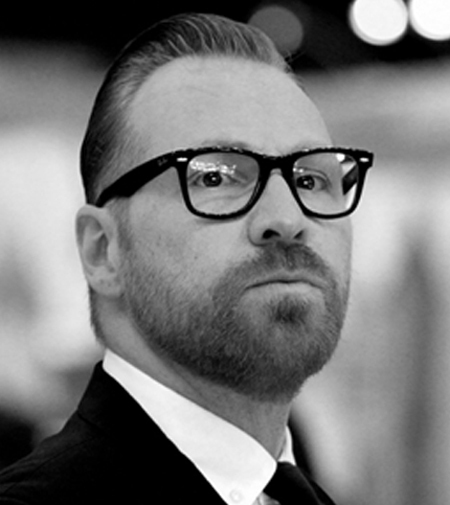 He gives us some advice on how to get ahead in the competitive world of fashion. 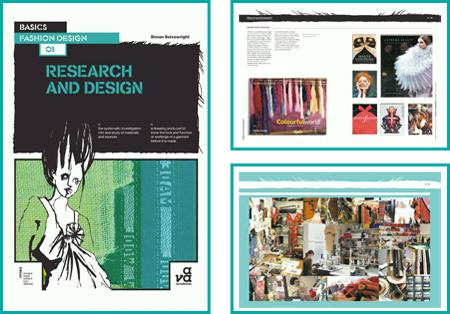 His book, Basics Fashion Design 01: Research and Design, is available from our website. He is in the process of writing a 2nd edition, which will feature lots of new interviews with designers. AVA: One of your students, Rhea Fields, won the River Island prize for womenswear at the 2010 Graduate Fashion Week in London. How important is this show for young designers and what do they get out of it? SS: Graduate fashion week is now it to its 20th year and has been part of the academic calendar for over 50 universities and colleges for all that time. It gives national and international exposure for our graduates and opens up opportunities within the industry. 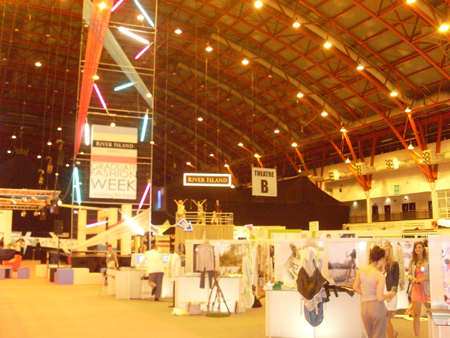 The event brings together all the design and creative fashion talent under one roof and allows talent scouts, design companies, recruiters and agencies to view all the newest portfolios with a mind to employ or offer internships. The catwalk show provides those lucky enough to be selected with national press exposure and an immediate access to the industry through the competition prizes and awards given out. Rhea Fields won the womenswear award and has now been taken on by River Island, the title sponsors, as their new directional tailoring designer. 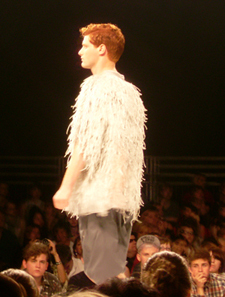 The winning collection by Rhea Fields, entitled ‘About a boy‘, one of Simon’s students at GFW 2010. 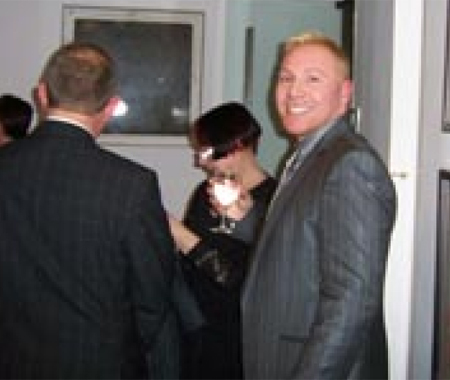 Find out what Simon had to say at the time here. AVA: Designers who focused on menswear at GFW were in the minority. Do you have many more female than male students, and do they tend to focus on womenswear? What are the main differences between designing the two? SS: It is true that there is probably a 10 to 1 ratio of women to men designing currently within the courses across the country. But that is not to say that only men design menswear. I currently have 4 girls studying fashion specifically looking at menswear. There used to be huge differences between the two genres but over the last decade both have become much more blurred with women wearing more androgynous silhouettes and men wearing more relaxed feminine fabrics and shapes. Menswear tends to consider much more closely the finer details in construction and elements such as pockets and functions. Womenswear can often be more disposable whilst menswear tends to cater for longer life more classic pieces. But as already stated this is changing rapidly and both high end and high street are catering for more experimental and high design menswear. 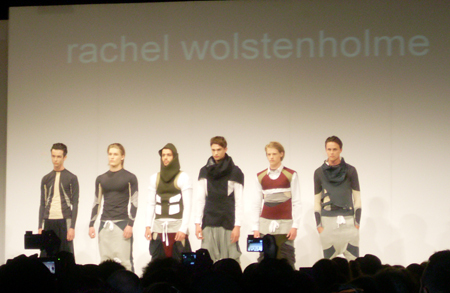 Menswear collection by Rachel Wolstenholme from the UCLAN show at GFW 2010. 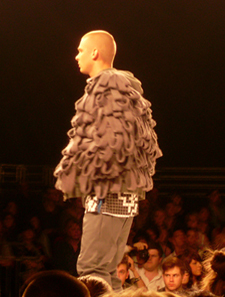 Menswear by Penelope Armstrong at the Manchester Metropolitan show at GFW 2010. AVA: Which parts of fashion courses are most enjoyable to teach/do students most enjoy learning about? SS: I love the beginning of the journey, taking students with little experience but a keen interest and through teaching and learning and my own passion for the subject transforming them into young skilled creative and employable designers. Showing them how to research and design, how to even see the world around them as one giant opportunity to be inspired. It is a wonderful feeling to finally see a student you have taught and nurtured reach independence and maturity in their abilities. I have been teaching almost 15 years and some of the earliest students I taught are now established and successful designers and stylists in their own right, and that is an amazing thing to think you set them on the path of not only working in the fashion industry but also having great success. AVA: What are the emerging trends in Fashion teaching and development? SS: I don’t really see it as a trend but simply how higher education has to evolve in these current financial times. Fashion is a huge and ever changing industry and so many courses exploded onto the scene in the last 10 years to supposedly cater for that change. Specialist courses in fashion PR, sales and merchandising, fashion styling, make up, fashion media, photography and internet design to the point where we now have an educational saturation in the market and I feel there are simply too many courses and not enough students. With the government change on funding and students now having to potentially pay over £6000-8000 per year for their tuition, I feel that the universities will need to look closely at the courses they have in their portfolios, as there may not be enough demand. The British Fashion Council commissioned a report to review the skills that employers were looking for from the university graduates in fashion and shockingly found many to be unemployable once graduating. Many young graduates lacked the core and basic business skills to succeed and needed to gain experience within the industry before they were able to be taken on to full time employment. The first year after graduating could be seen like another year of education, but this time within the industry. The BFC also found that some of the most basic skills in pattern cutting and construction were also being lost for the sake of design. Students could draw and present beautiful ideas but had poor manufacturing ability. This made it increasingly difficult to then work within the industry as the understanding of sampling and production was not considered in their design process. So it is my belief that the universities offering fashion in their portfolios need to look to delivering courses that provide not only academic study but also industry experience as part of the curriculum. Northbrook College along with many universities currently offers work experience as part of the delivery and assessment of the course. It is such a massive part of the learning for our students and provides that essential real industry experience with academic teaching. 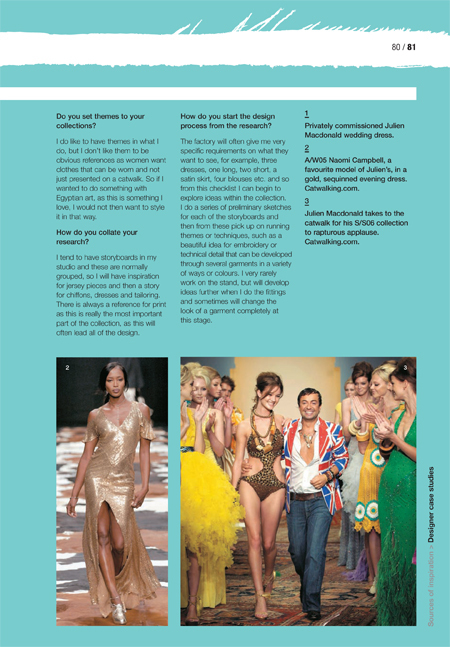 Interview with fashion designer Julien Macdonald in Basics Fashion Design 01: Research and Design. AVA: Fashion courses have become very popular in the last few years – what do you think is driving that, and will it continue? SS: I think part of the interest comes from the burst of television programs related to fashion, Trinny and Suzanna some years back started that craze for styling and fashion awareness, now we have Gok and his customizing approach, everyone can be a fashion stylist or designer. There is also that celebrity aspect, so many designers are now as well known as their clients, gracing the covers of gossip magazines and seemingly living the high life, champagne and glamour!! I think many see fashion as a glamorous and easy industry to enter, “I love clothes therefore I must be good at fashion…” Of course for many it is a massive wake-up call when they realize fashion is one of the toughest and most ruthless industries to try and be employed within. AVA: The AVA Basics Fashion Design series has been very successful and widely adopted – what do you think are the factors that make these books stand out? SS: I think the books tapped into a market where many of the educational books were written for the academic tutors and not for the students. The easy-to-read and highly visual books provided a wealth of colourful and exciting information in a very digestible amount. The use of student and designer case studies also made the information given relevant to the reader and linked it to the industry. Click on the image above for more information about Simon’s book. 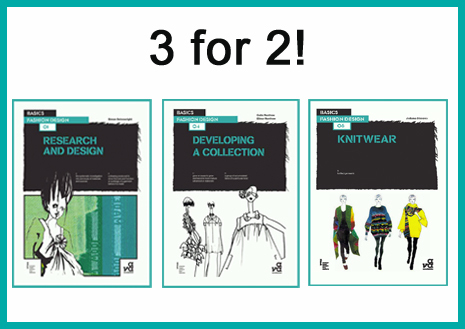 AVA: Are the books suitable for all types of fashion courses…and are they really just for students? 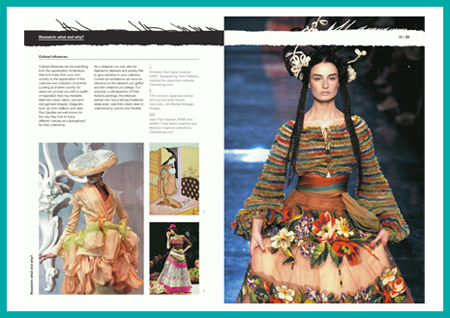 SS: I think the books are highly useful for academic study at both post compulsory and undergraduate level as they do provide the underpinning knowledge and skills that most fashion-related courses offer within their curriculum. But having had the chance over the years to talk to people and friends about my book they have said that it is interesting and accessible to someone who has little to no experience within fashion, due mainly down to the fact the language it is written in is basic and easy to read. So many of the other textbook fashion titles can be so catered for specific academic purposes that they are difficult to understand whereas the Basics series helps explain many of the skills and processes through well chosen imagery as well as simple text. AVA: What was your first job in the fashion industry? Have you always wanted to be involved with fashion? SS: My first job was working in Paris in 1994. I was trained as a woven textile designer at the University of Brighton, and I went to Paris to work for a fashion trend styling bureau called Trend Union and Li Edelkoort studio. They used to produce wonderful books for clients all over the world that provided them with trends and forecasting ideas for colour, fabric and fashion. Brands such as Marks and Spencer’s to L’Oreal came to the company for advice and ideas on what was going to be in fashion several years in advance. I loved working within this environment because Li had so many talented and varied people working for her, from stylists, consumer behaviorists, photographers, designers, textile designers, editors, graphic designers to chefs! It was a great year and one I will always remember. As for always wanting to be in fashion, I think that I have always been interested in textiles and colour, and at the time of my studies courses were often fashion textiles and so you did a bit of everything. My talents in fashion were quite slow to start really as I was more interested in the fabrics that I could create first. The fashion was almost secondary to me when I was in university. It was not really until I graduated and won “graduate of the year“ at one of the early years of the Graduate Fashion week event in London, that I found myself suddenly wanting to work in the industry. AVA: Can you tell us about what you have been doing since you finished writing BFD: Research and Design? SS: I have been very busy with my academic career. Shortly after the first book was published I moved from Northbrook College Sussex to Southampton Solent University to run the fashion programmes in design, media and photography. This was a huge step up and a great challenge, as well as a huge learning curve. I was responsible for over 400 students and a much larger team of staff. I survived for 18 months, but it was actually the commute from Brighton everyday that ended the contract and not the job! So I returned to Northbrook College but this time to head up the fashion design degree, something I had wanted to do prior to leaving 2 years previously. I have also been presenting my book and doing a series of lectures on research and design methodologies at several universities around the world, namely in Shanghai, China, London and Cardiff, Wales. 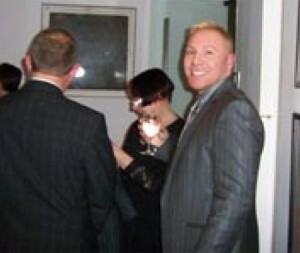 Simon at his book launch. AVA: What are the important dates in the calendar for everyone involved in fashion? Which do you most enjoy? SS: Fashion has many dates throughout the year, but essentially works on the two main seasons, Autumn/Winter and Spring/Summer. The collections are shown for A/W of that year from January to March and then for Spring/Summer the following year in September to October, the cycle is always 6 months ahead. However with Haute Couture, menswear and pre-collections the seasons and times for showing are becoming more drawn out and so it is possible that at any point in the year someone from some sector of the industry will be showing! I love the change of seasons in fashion, but I suppose my favourite is Autumn/Winter as it brings so many different textures and product lines, such as knitwear, outerwear, tailoring, skins and furs. 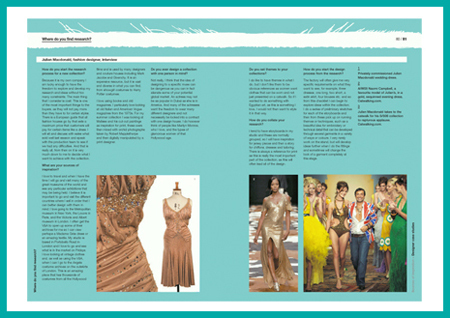 Pages from Simon’s book, Basics Fashion Design 01: Research and Design. AVA: What are the best resources for fashion students? Do they have to keep on top of current trends or is it more important for them to focus on their own ideas? SS: Resources for inspiration can, as the BFD: Research and Design book teaches, come from anywhere. The opportunities for inspiration and creative stimulation can be, once realized, drawn from all around you, so a good student/designer is always looking for the next thing to be inspired by, whether it is a holiday in a different country or a period in time to an emerging artist or crafts person. I think any successful designer has to keep an eye on what is happening within the world. Not specifically fashion trends, but certainly on what is happening in the global economy. Certainly issues of ethics and sustainability are key concerns to the fashion industry right now as well as the use of new and innovative technologies. So any new and emerging designer should be mindful of these when seeking employment or creating a brand identity. AVA: Where is the best place to start if you are looking for a job in fashion? Do you believe formal qualifications are necessary or should students concentrate on getting internships or other work experience? SS: As discussed the only way into the industry is through experience and this comes through internships, work experience opportunities whilst still at college, apprenticeship schemes, in house training, places such as TopShop and Arcadia group run these types of opportunities. It may be that you have to work for free and do lots of short placements in companies, 3 weeks, a month, a week can all be beneficial and give you the much need experience within the industry and build up you skills and CV. I always encourage my students to try and gain a few placements with big design names, even if it means doing the tea run or boxing up samples for PR. Having the name on your CV is a great starting point for conversation at interview. I then encourage them to gain a placement that gives a more hands on experience, so perhaps a young and emerging designer or brand. This way you might gain experience and insight in to several different aspects of the job, pattern cutting, garment construction, production and sample quality checking, press and PR, sales and working more closely as a small design team. Work experience may also mean that you need to work in a completely different part of the industry to gain insight into the business, so perhaps working as buyer or liaising with production companies in the Far East. All the experiences can build to a set of new industry skills and CV opportunities in your first year from graduating, and in treating the first year as an extension of your educational programme will provide you with a much stronger foundation for success in the industry. AVA: How do you feel about the fact that most students can’t afford to purchase pieces of designer fashion? Have labels become more important than innovative style? SS: Actually I think that fashion has become so accessible in the last decade that anyone can look great whatever their budget. The British high street has become a world leader in creating new, innovative and direction clothes for the masses – notably the success of TopShop and its Unique range that now has its own showcase at London Fashion Week. So where as high street brands were copying high designer brands and trends, TopShop is now making its own trends, and stylist and celebrities are all mixing the fashion labels. It is no longer cool to be a slave to one brand, and mixing cheap with chic is certainly the new and modern way of dressing. Students, especially fashion students, have always had the ability to source vintage designer fashion and mix it with their own style, be it homemade customised or high street, it’s just that the whole industry has finally caught up with this concept. A section from Simon’s book dealing with flea markets and buying and customizing second-hand clothes. AVA: Do you think it’s important for students to learn about the areas of design that they might not wish to be involved with, or is it more important to specialize early on? SS: Having a broad knowledge and skill set in fashion is vital as the student may not actually gain employment within their first expected discipline. Being able to adapt and work in all areas can significantly improve your chances for a successful career. You may not be great in all areas, but by having a bit of knowledge you will be able to better understand and appreciate the many different job roles and people you may have to work with or for. 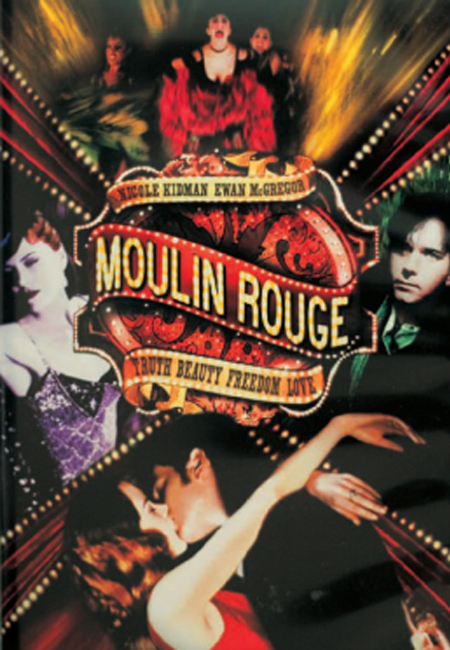 AVA: In BFD: Research and Design, you mention the interest in corsetry and the burlesque stimulated by Moulin Rouge, and the buzz about 1960s fashion created by the film about Edie Sedgewick, Factory Girl. Is there a book or film or even a particular era that has ever inspired you or that you would like to create a collection for? SS: I love old Hollywood films from the 1950’s. “Designing Women”, with Lauren Bacall is one of my all time favourites. She plays the part of a fashion designer and creates the most fantastic clothes that sculpt and shape to that amazing hourglass silhouette so synonymous with the 1950’s. The women looked so glamorous and the men so dashing, I loved this era for fashion as the stereo types were so strong. AVA: Who are your favourite designers? 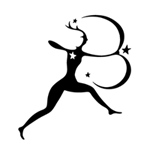 Are there any up-and-coming designers who have emerged since your book was published? SS: I don’t really have any single one designer who I love as I try and have an appreciation for all good creative design. I guess if there was one it would perhaps be Alexander McQueen before he died. His use of traditional tailoring and crafts allied with roguish anarchy and absolutely modern innovation created a whole unique industry around him. His talents have inspired many and his legacy will be true talent, craftsmanship, humour and showmanship. As for the new? I still believe that London is the melting pot for new and exciting talent. We are uniquely able to train, support and nurture the greatest designers in the world, but sadly it is often the rest of the world that then gains those designers and industry specialists. As a country we need to look to keeping our home grown talents and stop them from fleeing to America, Europe and the Far East were they are paid and respected much more highly. AVA: If you could choose, which celebrity would you like to dress? SS: I am not really into celebrity endorsements. A beautiful woman or man that looks and feels great in their own skin first and then the clothes will complement second. AVA: Can you give us any fashion tips for trends this year?! SS: It is all about bold clashing colour this summer. Think hot pinks with orange and yellow! AVA: AVA’s books now have an Ethics section at the back. How important is the issue of ethics to you personally and in the fashion industry in general? What can people do to make more ethical decisions when it comes to buying clothes? SS: Ethics is a current issue that the fashion industry has to address. “Fast Fashion” is starting to perhaps run out of pace as consumers are becoming more and more aware of the ethical problems in buying clothes that cost nothing and are disposed of in weeks of purchase. How something is sourced, manufactured and sold is vitally important to the stability of our global community and fashion is a billion dollar industry that can play a significant part in the growth and sustainability of third world economies in the future. Academics can download this ethics section from AVA’s website for free through the supplementary material link in the academic section. We are also currently offering Simon’s book as part of a 3 for 2 deal. Click here for further details. I will immediately seize your rss feed as I can’t to find your email subscription hyperlink or e-newsletter service. Do you have any? Kindly allow me know so that I may subscribe. Thanks. We’ve only just added an email subscription service to our blog – you can find it in the right-hand side bar on the home page. I read your blog, it’s lovely but Interesting article is: What are the emerging trends in Fashion teaching and development?